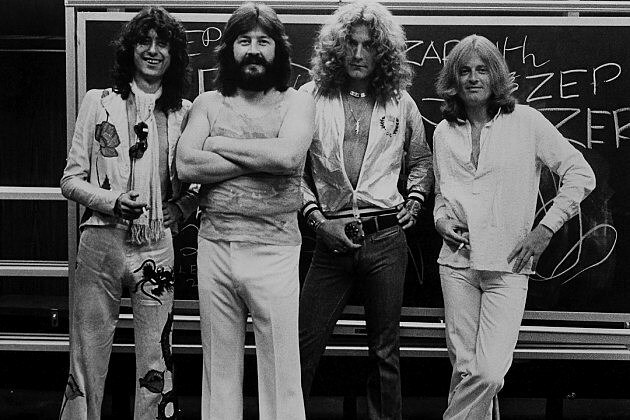 No one really knows where Led Zeppelin's music might have gone if the band hadn't broken up following John Bonham's death, but Jimmy Page has a better idea than most — and he thinks the band's new direction would have been positively "hypnotic." Page looked back on the band's final days during a recent interview with Classic Rock Magazine, insisting that the relationships between the band members were "good, as far as I knew" and shrugging off Robert Plant's later confession that the lyrics to "Carouselambra," from 1979's In Through the Out Door, were a veiled commentary on Zeppelin's fraying creative chemistry. "I’m sure they were, but I didn’t know. The way we listened to music then was to make your own interpretation. We were still a few years away from videos, where they told you what the song was about," said Page. "In the early stages of Led Zeppelin I wrote lyrics – but if I’d concentrated on lyrics, I wouldn’t have been able to give as much attention to the guitars." And on the subject of Page's focus on guitars, he again refuted the notion that he was too incapacitated to play during the band's later years, insisting, "When I needed to be focused, I was really focused. Presence and In Through the Out Door were only recorded in three weeks. That’s really going some – you’ve got to be on top of it." And as for that hypothetical ninth Zeppelin album? Page says he and Bonham talked about it, and were leaning toward a heavier sound focused on "interestingly constructed riffs and hypnotic music" that would have taken full advantage of Bonham's crushing drum power. "John and I spoke about this a lot," he added. "Let’s put it this way – on the next album, John wouldn’t have been playing with brushes. John loved the idea of anything where he could really get going."